Set in 1920's England, Charlotte Jones's Airswimming is based on the true story of two women (Miss Kitson and Miss Baker), who have been incarcerated in a hospital for the "criminally insane" for having borne illegitimate children. Forgotten by their families and not released until the 1970's, Dora and Persephone adopt alter-egos, Dorph and Porph, to enact their fantasies and survive the silence of incarceration. By turns very funny and moving, Airswimming reminds us of the forgotten women of these generations in both Britain and Ireland. 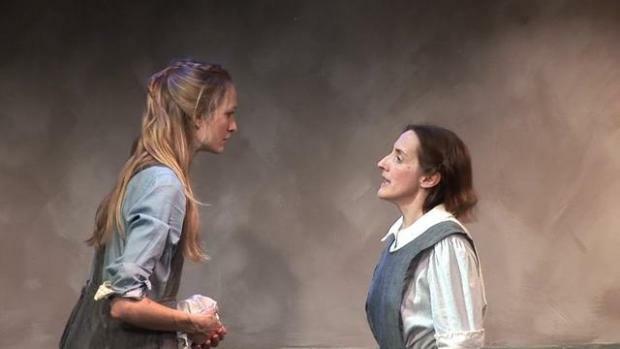 Aedín Moloney and Rachel Pickup, seen in The Irish Rep's 2011 revival of Brian Friel's Dancing at Lughnasa, star as Dora and Persephone, respectively.